Kenmore dryer will not start after completing 1 load. It gives off a smell that could be electrical burning or burning rubber. Can't tell. The dryer will start after it cools off for some time. I took the dryer apart to look for issue. The belt & the 4 rollers look OK. The belt tensioner looks OK also. The drum is able to turn while running. I vacuumed out all of the lint out of the internals. Still have the same problem. Check the exhaust vent on the rear for a blockage. Run a load with the vent removed and then see if it starts a 2nd load OK. Removed vent and still have same issue. Do you suspect motor or thermostat/heat sensor? If it is the motor, why am I able to complete 1 load and it doesn't stop mid-cycle? Also check these area's I have pointed out in the photo for lint build up. 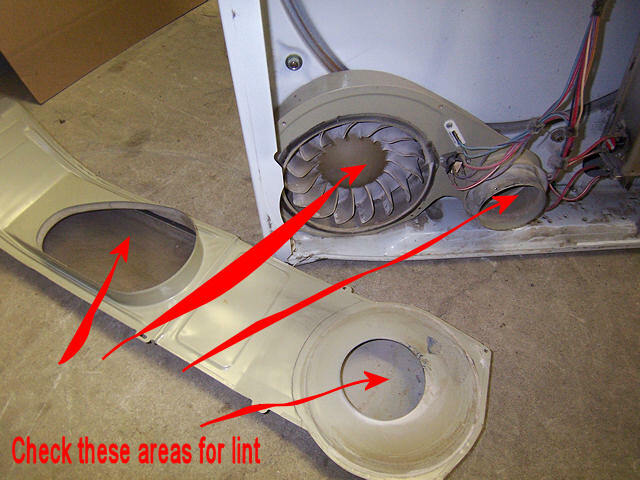 If everything is clear of lint you may simply have a bad motor that needs to be replaced. And check incoming wire terminals. Loose wires will cause the dryer to overheat. This is a gas dryer ? Heat quiting after one load or Motor? It is a gas dryer. Lint filter is in the door. The drum does not turn when it fails to start the 2nd load. It makes a buzzing noise indicating it is trying to start. Can't remember if the flame came on or not. I have already cleaned the lint out of the ductwork downstream of the fan blade inside of the machine. Unless I'm missing something even if it happens to be the motor overload that is bad you can not order and replace just the motor overload you need to replace the motor. The new motor will have a new overload on it. I'm going to say the motor is bad and the overload is doing it's job by tripping the motor out because it gets to hot or draws to many amps. Replace the motor and you should be good to go. This is a very common dryer motor. I said it because my fingers stopped typing while my brain was still working. Bad motor. Out on overload. x 2 for the motor. Did it fix it?